Management theory is the theory about management. The first comprehensive theories of management appeared around 1920. Towards the end of the 20th century, business management came to consist of six separate branches, namely: financial management, human resource management, information technology management, marketing management, operations management or production management, and strategic management. 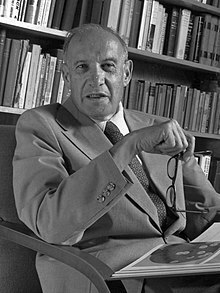 Peter Drucker's groundbreaking work turned modern management theory into a serious discipline. -- Academy of Management, 2011. Drucker's career as a writer, consultant and teacher spanned nearly 75 years. His groundbreaking work turned modern management theory into a serious discipline. Management theory is a multidisciplinary academic field, whose links to practice are controversial (eg, Astley & Zammuto, 1992; Barley, Meyer, & Gash, 1988; Hambrick, 1994). James W. Dean, and David E. Bowen. "Management theory and total quality: improving research and practice through theory development." Academy of management review 19.3 (1994): 392-418. There will be no drastic revolution in management functions or organizations in order to encompass systems management. Rather, the adaptation of systems management theory to organizations has been and will continue to be an evolutionary process. [Jay Wright Forrester]] in: Management and Management Science (1959) in: Howard L'Amie Sampson. A Model for Applying Systems Management Theory to a Large School System, 1968, p. 68. Although students of management would readily agree that there have been problems of management since the dawn of organized life, most would also agree that systematic examination of management, with few exceptions, is the product of the present century and more especially of the past two decades. I hope the reader will realize that, in outlining the eleven approaches, I must necessarily be terse. The contingency or situational approach : ... the contingency approach to management. This page was last edited on 11 October 2016, at 12:11.